Dell Quiet Tower Server PowerEdge T320 Octa 8 Core Xeon 24GB RAM 8x LFF Storage. 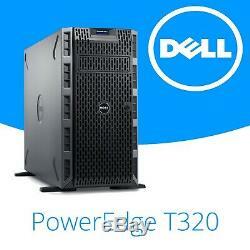 Model: Dell PowerEdge T320, Dell T320, PowerEdge T320. CPU: Custom Configurable; Intel Xeon E5-2407 2.40GHz Quad Core or Intel Xeon E5-2450L 1.80GHz Eight Core. RAM: Custom Configurable; 8GB, 16GB or 24GB RAM. HDD: 8 x LFF (No Drive or Caddies installed). RAID: Custom Configurable; Dell PERC H310 or Dell PERC H710 RAID Controllers. See below for more specs..
All of our servers are refurbished to a very high standard. Internal parts (such as RAM and CPUs) are tested individually, and once the components are installed the system is tested in full. Expansion: 5 PCIe slots: 1x PCIe x16 slot with x16 bandwidth, 3.0, full-length, full-height, 1x PCIe x8 slot with x4 bandwidth, 3.0, half-length, full-height, 1x PCIe x8 slot with x4 bandwidth, 2.0, half-length, full-height, 1x PCIe x8 slot with x4 bandwidth, 3.0, full-length, full-height, 1x PCIe x8 slot with x1 bandwidth, 2.0, full-length, full-height. Interfaces: Dual Port 1GbE RJ45. RAC: iDRAC7 with Lifecycle Controller. Dimensions: 79 x 61.6 x 44.4 cm. Weight: 25.8 Kg Approx. Please follow the exact instructions below (as pictured). This is a realistic estimate based on past performance and we aim to achieve this on 90% of orders. A forklift is not required. Large items may be sent on a pallet and tracking for these items bay be available upon request. For EU deliveries all items are sent with UPS (Tracked). We use these companies in complete confidence that your parcels will arrive safely without any damage. Packaging: We use custom protective moulds that surround the corners and edges of our machines. The foam mould not only protects the machine from impact and physical damage, it suspends the machine in the middle of the box preventing damage to the machine should the box become damaged. We are aware that mistakes and problems can always occur but we will endeavour to get any issue resolved as quickly and fairly as possible. This right is limited to 30 days from the date you take ownership of your product. You can, however, ask for a digital product to be repaired or replaced if it develops a fault. And if this isn't possible, or is unsuccessful, you have the right to receive a price reduction. The item "Dell Quiet Tower Server PowerEdge T320 Octa 8 Core Xeon 24GB RAM 8x LFF Storage" is in sale since Tuesday, February 5, 2019. This item is in the category "Computers/Tablets & Networking\Enterprise Networking, Servers\Servers, Clients & Terminals\Computer Servers".